Retirement is a milestone event that rewards the hard work and achievement of the diligent worker. Retirement means freedom from the world of work, a time of rest and a time to enjoy the fruits of years of labor. Finding the right retirement gift is an important endeavor, and should be undertaken with care. There are many gifts out there, and they are as varied as the recipients who will enjoy them. The search for the right retirement gift does not have to be difficult. All that is needed is a little know-how and determination. Purchasing a gift for a male retiree is often a simplified process. The right gift will depend on the nature of the man’s work, his hobbies and interests and his personality. Personalized keepsakes – Perfect for the sentimental man, a personalized keepsake is a gift that will be treasured for years to come. A bronzed plaque or trophy, a medallion or crystal paperweight make classy gifts and are most appropriate for executives, business owners and corporate professionals. Acrylic and silver are the most sought after materials when purchasing a keepsake as they exude professionalism, class and taste. Clocks – Also great for retired executives, clocks hold significant meaning for the retiree. Usually mounted on a wood platform, clock gifts reflect the time that the man has poured into his craft, and show an appreciation for his hard work and persistence. Clocks can be personalized with a name or a date if desired. Business accessories – Accessories such as business card cases and pens make classy and elegant gifts for the retiree. Business card cases come in silver and wood grain, and can be monogrammed for a more personalized effect. Sterling silver or wood pens are also popular retirement gifts, and are well received by the retiree who has “written his own check” for a life free of work. Personalized keepsakes – For the woman who wants to keep the tangible results of her work near and dear, a personalized keepsake box makes an excellent gift. Usually inscribed with a message or sentimental poem, these gifts are classy and versatile. Keepsake boxes are often wooden, but can be found in acrylic, silver, gold or even glass. Accessories – There’s a good chance that your retiree may be planning to use her new free time to travel the world. Travel accessories make great retirement gifts for the newly retired woman. Leather passport holders, personalized luggage tags and monogrammed bags make excellent travel gifts that won’t break the bank. Send your retiree off in style with these travel accessories that reflect her sense of style and panache. Indulgent Gifts – Your retiree has worked long and hard to obtain this newfound status, so why not treat them to a little rest, relaxation and indulgence. Spa package gift certificates, champagne gift baskets and massage kits offer the gift of calming relaxation. 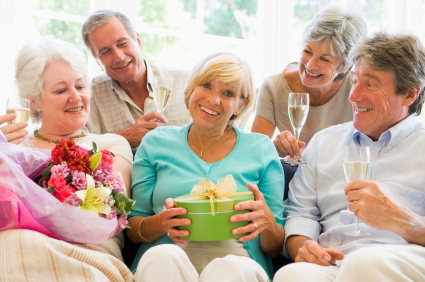 Sign your retiree up for the champagne of the month club, or treat her to a year of free massage. Your recipient will watch the stress melt away with your indulgent gift. Golfers – Your recent retiree may have big plans to hit the links as soon as they say goodbye to the workforce for good. Surprise her with a golfer’s gift package, complete with tees, balls and a nifty golfer’s bag. A box of personalized Titleist golf balls will be well received by the corporate executive looking to work on his handicap. A sterling silver, personalized golf flask set makes a great gift for your retiree that loves to golf. The possibilities are endless when it comes to finding the right gift for your retiring golfer. Gardeners – What better way to spend retirement than tooling around in the yard, beautifying the home. Gardening sets make an excellent gift for the retiree who has weeded out the thorns in his career and is looking to cultivate a masterful creation during retirement. Try a gardening set, personalized garden stakes, or personalized poetry stones. You’ll find that you’ve planted the seed in your retiree’s mind that you know your stuff when it comes to finding the perfect gift. Wine and Gourmet Connoisseurs – He has taste and style and he knows a great full-bodied wine when he sees one. She’s sampled cuisines of the world and has a palate that can detect the most imperceptible flavors. When looking for the right gift for your wine and gourmet food enthusiast, choose carefully. Wines of the month clubs are popular gifts for retirees, and he will enjoy sampling a new wine each month. Of course he will know exactly what meat to pair it with. A complementary wine glass set makes an excellent addition to this gift. Treat her to a year of gourmet cheeses, aged steaks or delectable fruits. She will appreciate your great taste when you give her a gift that complements hers. Many people give jewelry for retirement gifts. Watches, pearl necklaces, bracelets and cufflinks make excellent gifts for the retiree with whom you have had a close relationship. Choose a piece of jewelry that reflects the personality of the recipient. A watch is a classy and traditional gift for an executive. Reward a dedicated female assistant with a pearl bracelet or necklace. A pocket watch makes a distinguished gift for a professor or professional in academia. Giving jewelry as a retirement gift shows the depth of the appreciation you have for all that the recipient has added to the workplace. Teachers – Although it may seem cliché, giving the teacher an apple is a tried and true way to get on his good side. Try a golden apple inscribed with his name and dates of service as a classy gift. Or an acrylic desk accessory emblazoned with your star teacher’s favorite saying. Common gifts for teachers also include leather bound journals, for recording important retirement moments, monogrammed ink pens and desk sets. Consider purchasing a personalized planter to reflect the seeds of knowledge that she has sown over the years. There are no limits to the options for the perfect gift for your retiring teacher. Military – For the men and women who have bravely served our country in the armed forces, retirement can be a tremendous accomplishment. Aim for a gift that reflects the patriotism and honor that serving in the military embraces. A globe to signal the far reaches of the world that the military officer has traveled is a classy and thoughtful gift. A gold eagle plaque, emblazoned with an inspirational message shows appreciation and honor for the work he’s done. Looking for something a little more personal? Try a custom pendant engraved with her rank and title in gold or silver. Finding the right gift for your retiree does not have to a difficult or tenuous process. Rewarding the retiree for their years of service is a wonderful way to show your appreciation for their hard work, sacrifice and diligence. Your gift should be a reflection of both the quality of their work and the profession in which they have honed their craft. Choosing the perfect retirement gift is a thoughtful way to show your appreciation for a job well done.